Hello there! 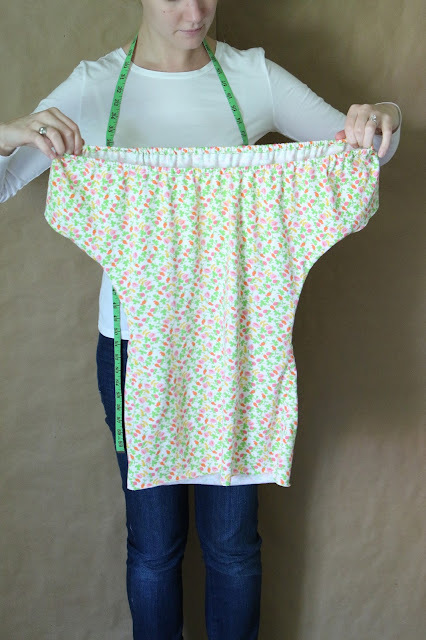 I am SO excited to release my very first sew along. 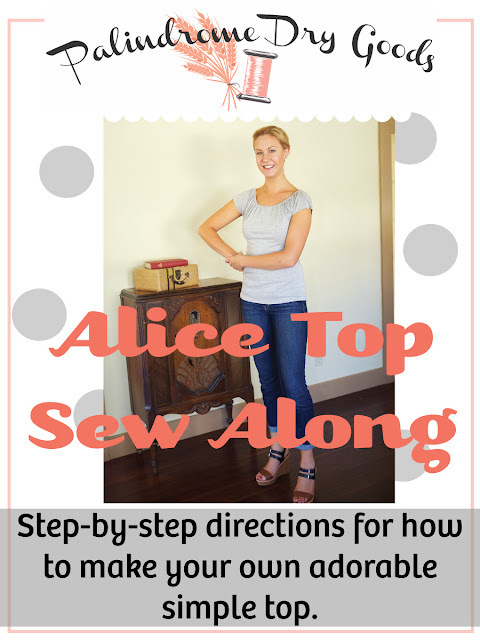 Through this post, I'll show you how to construct your very own Alice Top step-by-step. 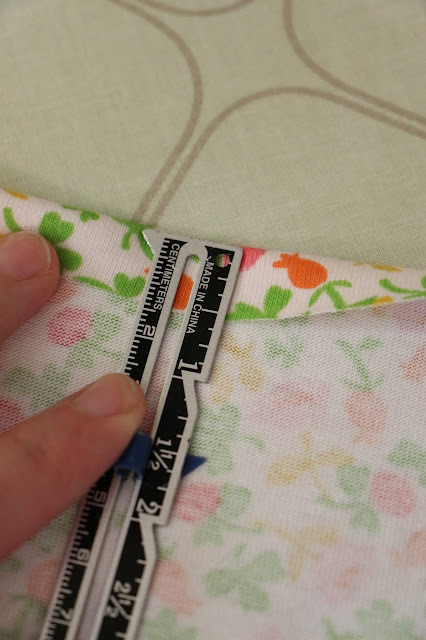 I'll virtually hold your hand through every pin, cut and seam, so you'll end up with an adorable top and build your sewing confidence along the way. 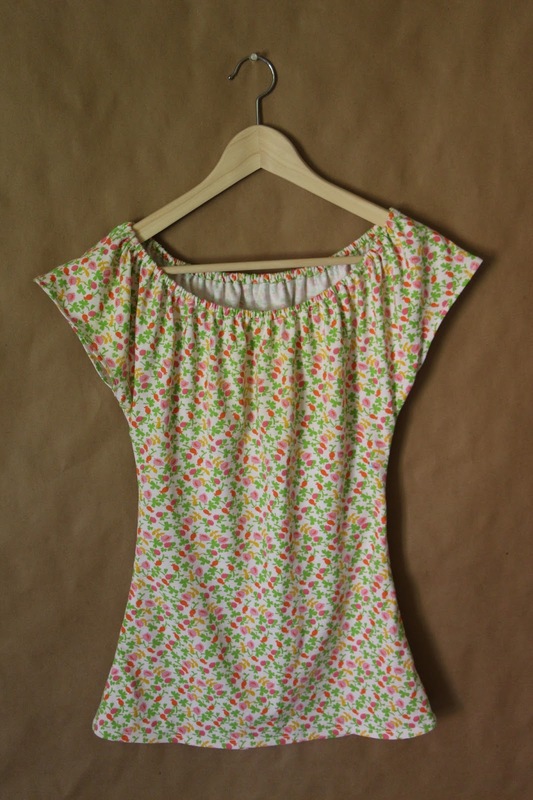 If you haven't already, the pattern is available for sale here. Ready? This is going to be fun! 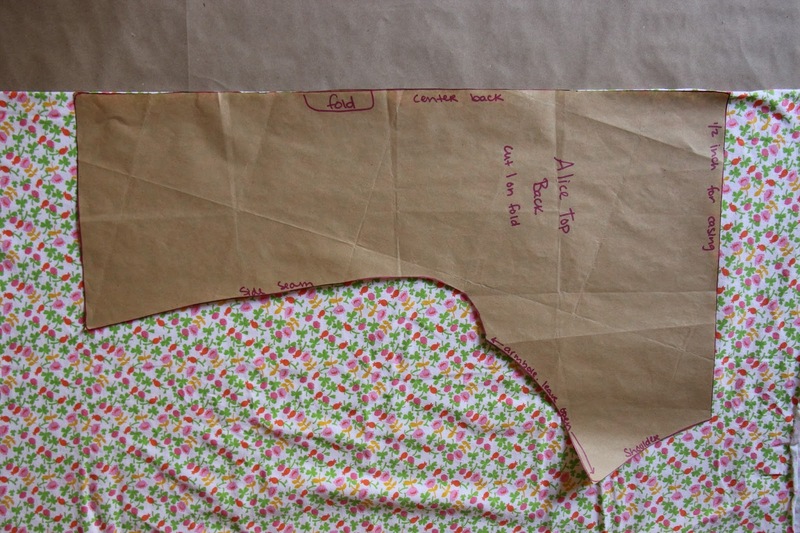 Ok, take a deep breath, and cut out your paper pattern pieces. 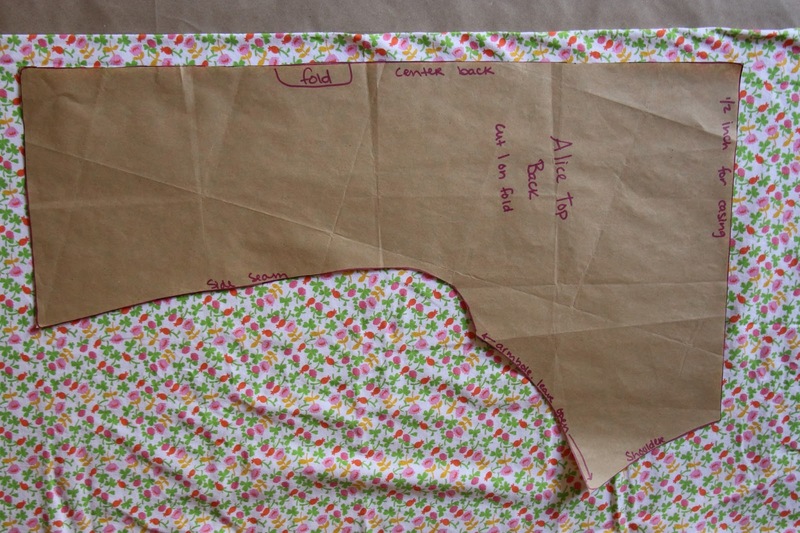 If you haven't already prepped your fabric, read this post first, to get prepared. 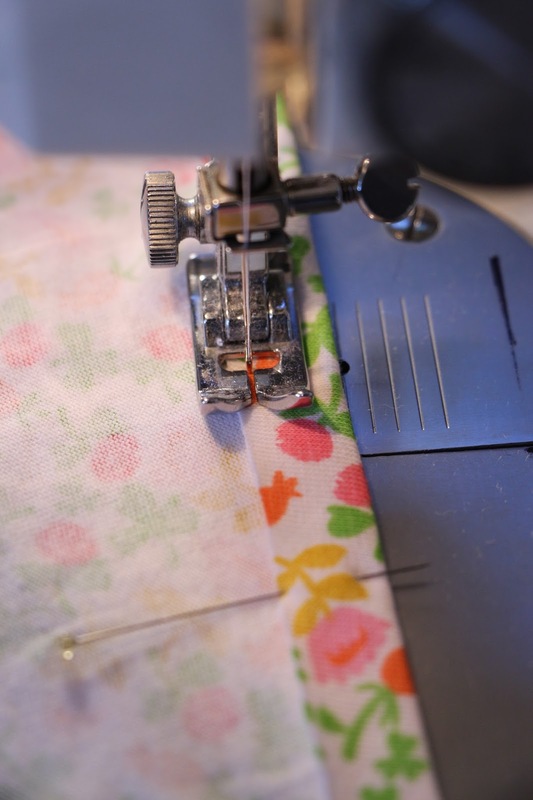 If you'd like a generic understanding of pattern symbols and some basic sewing terms, I highly recommending reading this post, or having it open in a second window to reference! 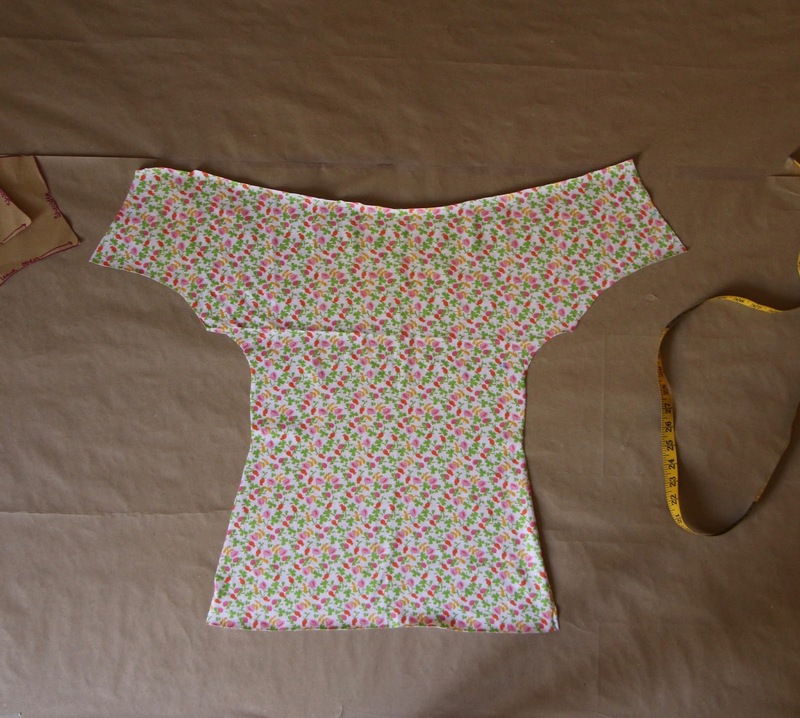 To measure your bust, make sure you're wearing a bra you'll likely wear under your Alice Top, place a measuring tape around the largest part of your chest, holding the tape loosely, so that you're not squeezing yourself smaller, but not so loose that the measuring tape wants to fall down in the back. The tape should go straight around your back. It should not sag down towards your hips, or arch up, towards your shoulders. Write down your measurement. 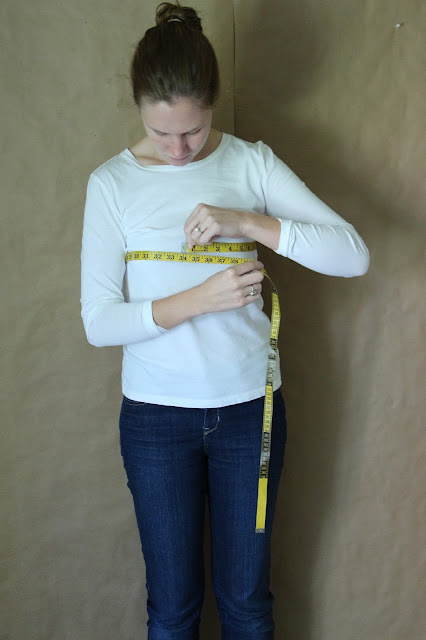 I'm a 34" bust and will use that measurement to make my Alice Top, but I will show you what adjustments to make if you are smaller or larger than my measurement. 1. 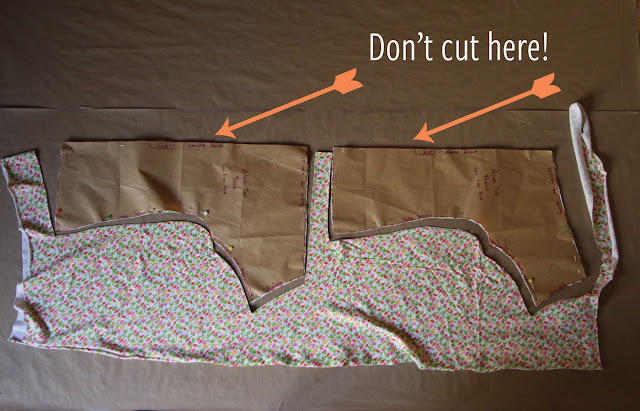 Lay your fabric out totally flat. If you have a big ol' table, then go ahead and put it to good use. I don't have a big table, so I have to do this on the floor, I fold up a towel to put under my knees as I work. 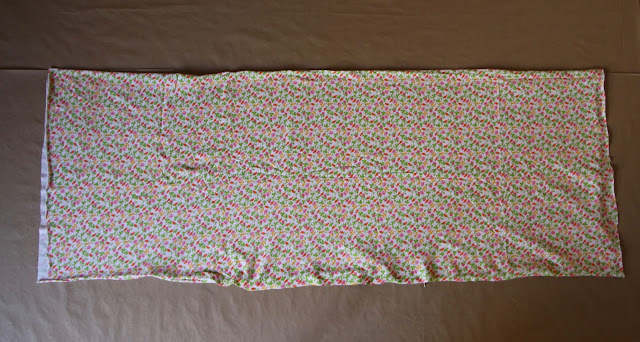 Fold your fabric in half, wrong sides touching (wrong side = ugly sides). pieces like the picture below, with the edges of the pattern pieces right up against the fold of your fabric. If your bust measurement is larger than 34": You're going to have to do a little math. I'm sorry. Take your bust measurement, and subtract 34. Take the resulting number and divide it by 2. Move both pattern pieces (front and back) away from the fold of the fabric by that much. 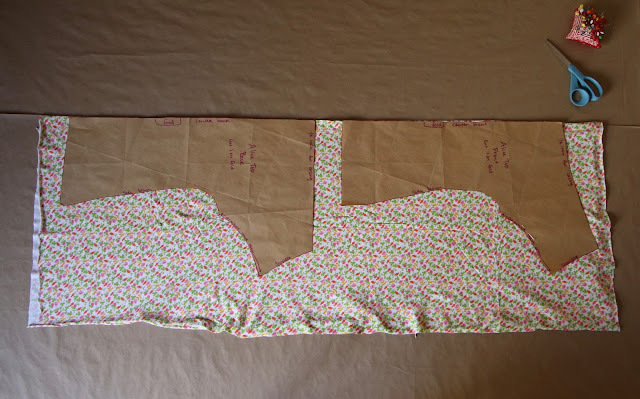 For example: If your bust measurement is 36"
You would then move your pattern pieces 1" away from the fold of the fabric. If your bust measurement is smaller than 32": You're also going to have to do a little math. I'm sorry. Take your bust measurement, and subtract 32. Take the resulting number and divide it by 2. Move both pattern pieces (front and back) over the fold of the fabric by that much. For example: If your bust measurement is 30"
You would then move your pattern pieces 1" over the fold of the fabric. 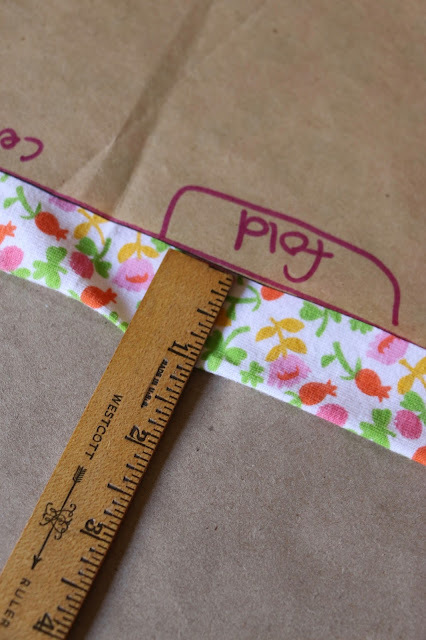 Let's pin and cut out our pattern pieces! 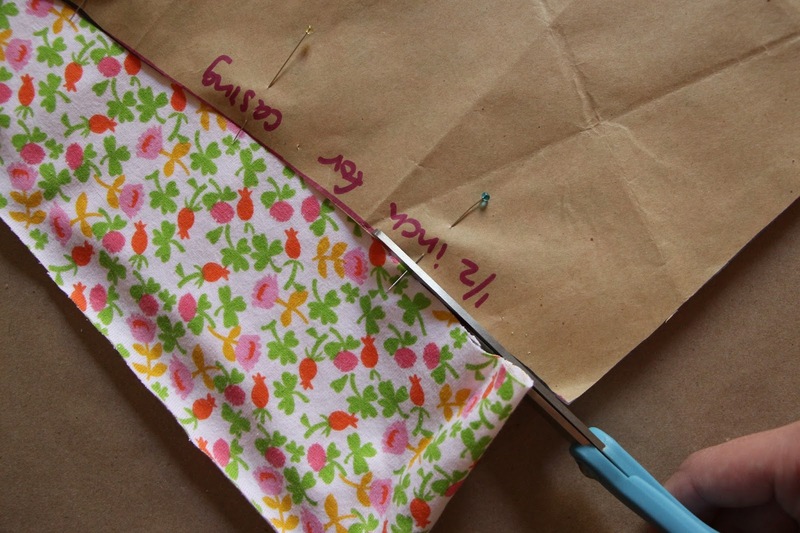 Place pins parallel to the edge of your pattern pieces, all the way around each pattern piece, through the paper and both layers of fabric. 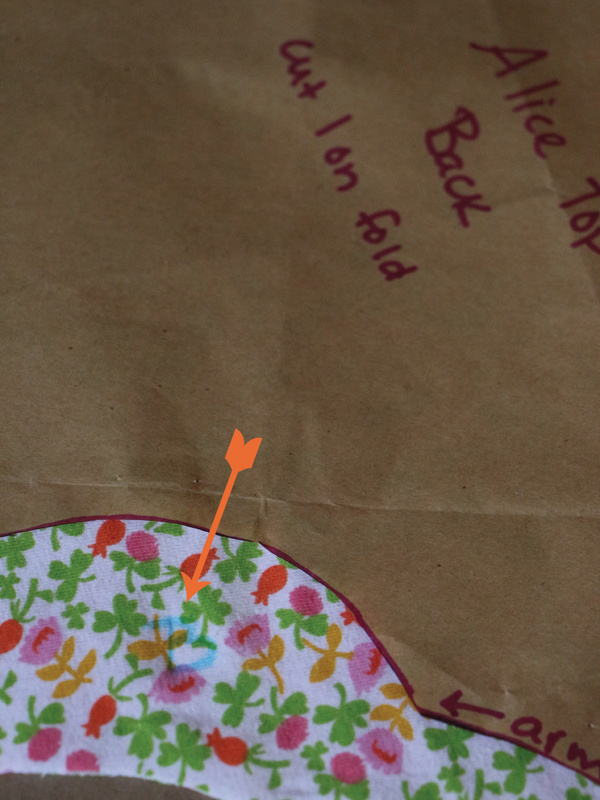 Why place our pins parallel to the edge of the paper? Because if we place them perpendicularly they will get in the way of our scissors. 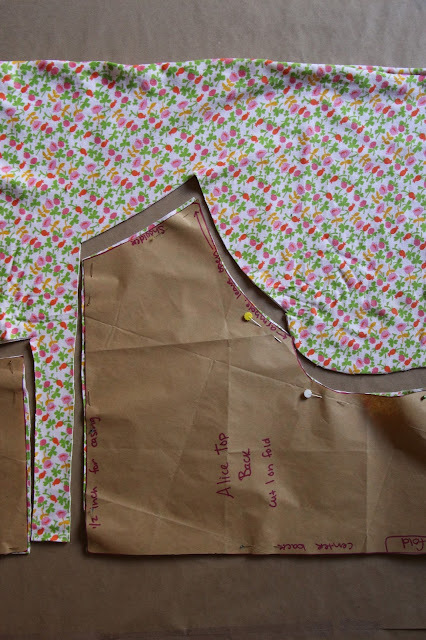 Cut out around 4 sides of your pattern pieces: the neck edge, the sleeve, the side, and the bottom. Unpin the paper patterns, but don't remove them from the fabric. 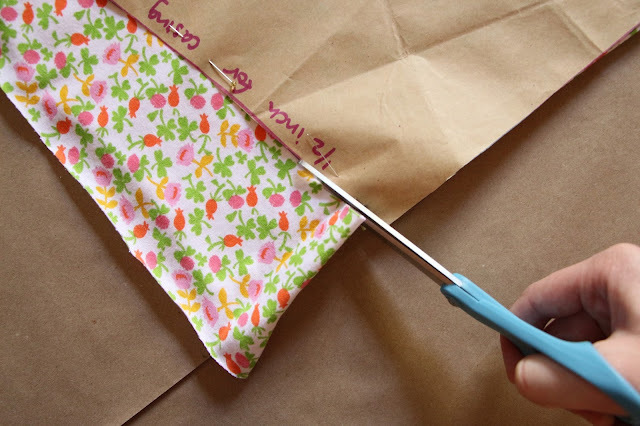 We're going to put some markings on our fabric. 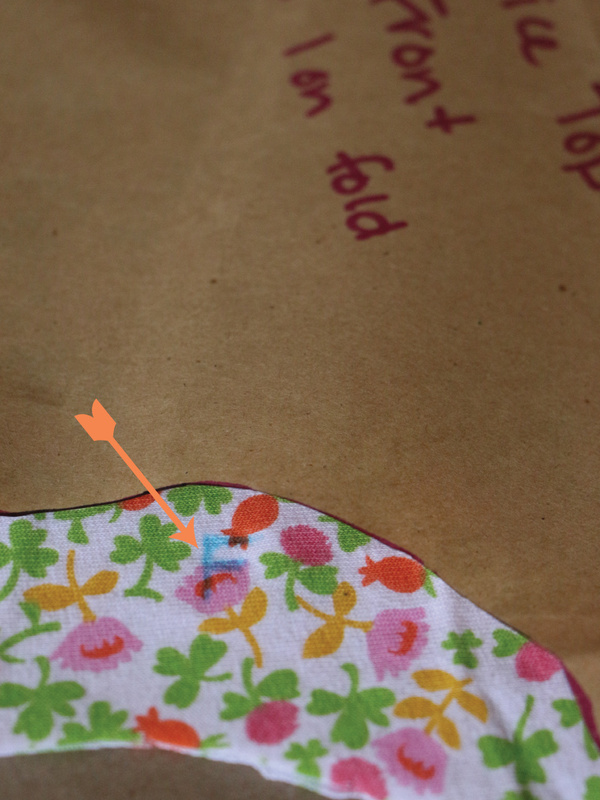 I wrote a large "B" on the back piece in a Sewcabulary-approved removable marking pen, you can also use tailors chalk. I also wrote "SH" on both sides of each pattern piece where the shoulder is. I marked a large "F" for front. You can now put the paper pattern pieces away. 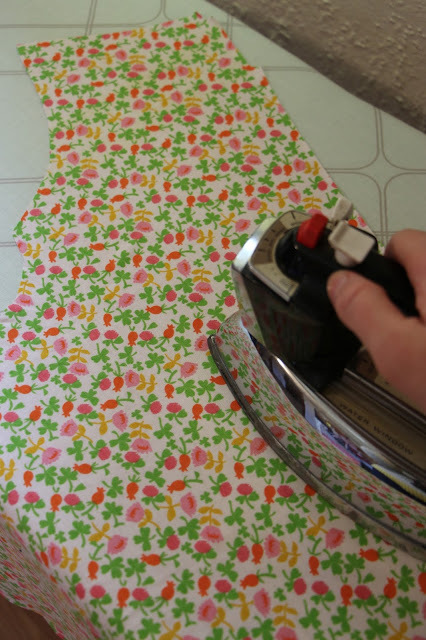 If your fabric is cotton, press out both pieces with the iron. 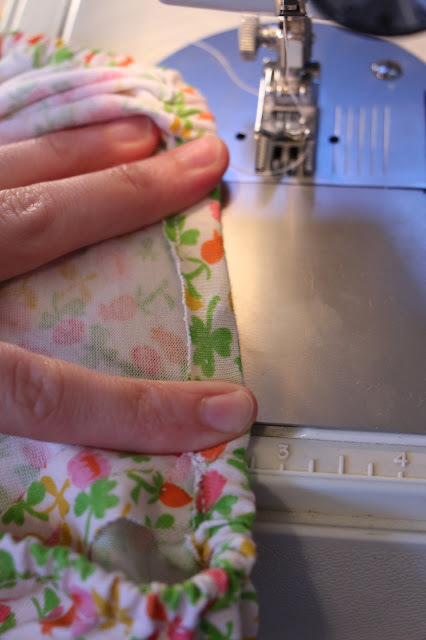 If it's polyester, or other synthetic fabric, don't press it, just smooth it out as much as possible with your hands. Place the "Front" piece, right side up. 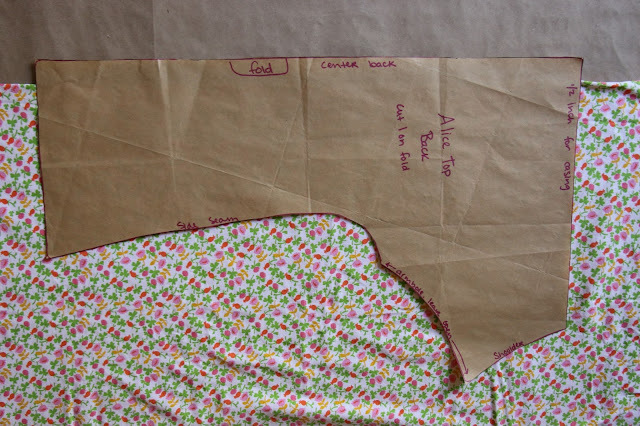 Now place the "Back" piece, right side down on top of the "Front". 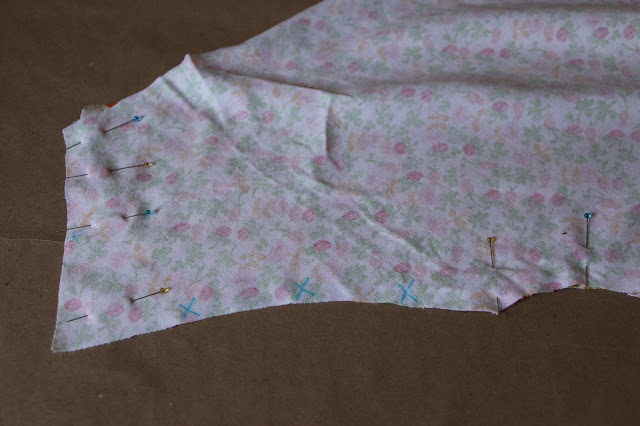 Smooth them out, and pin the shoulders, and the side seams. 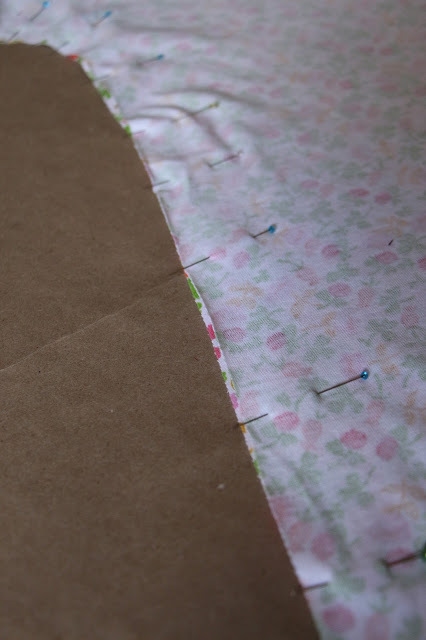 Place pins perpendicular to the edge of the fabric (the opposite of how we placed them when we cut out our pieces). 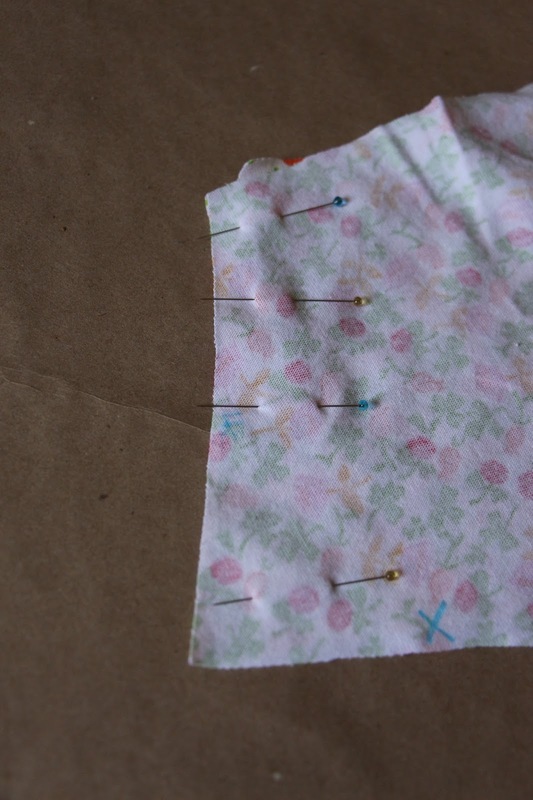 Here are the pins at our side seams. 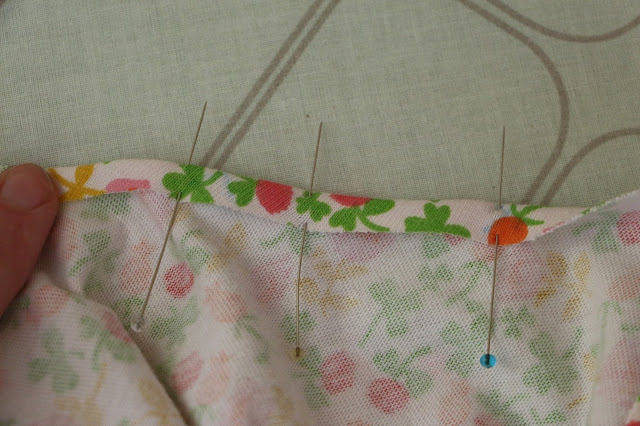 And here are the pins at the shoulder seams. 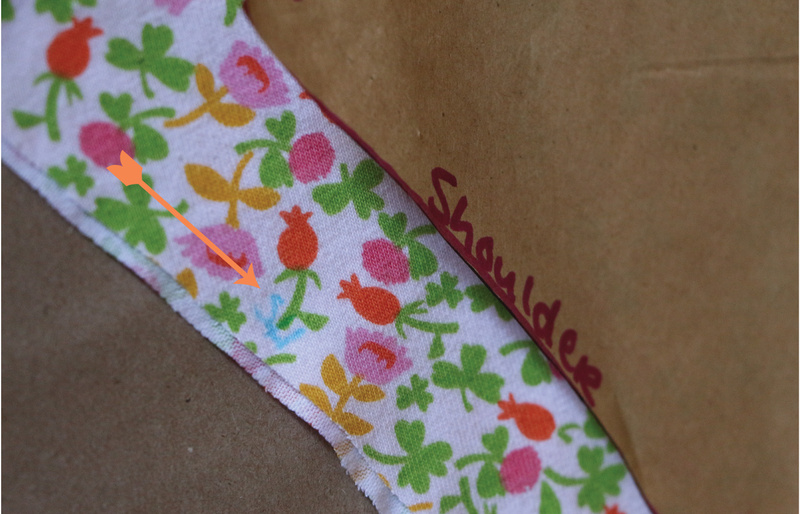 Let's mark some large "X"s along the armhole to remind us that we are NOT going to sew here. 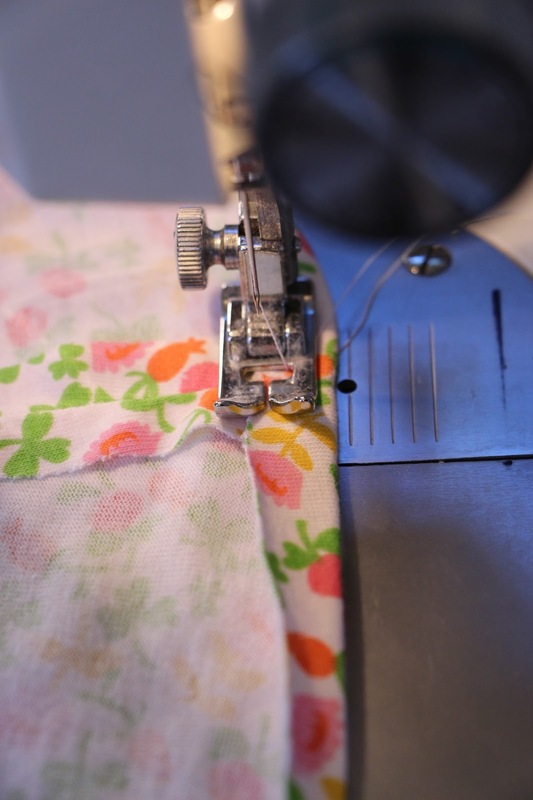 Let's sew our pieces together! Woo! We're going to use a triple straight stitch to sew this top together. On my machine it is denoted by three straight lines and three 'v' shaped lines right next to each other. Check the manual for your sewing machine if you're unsure which stitch to choose. 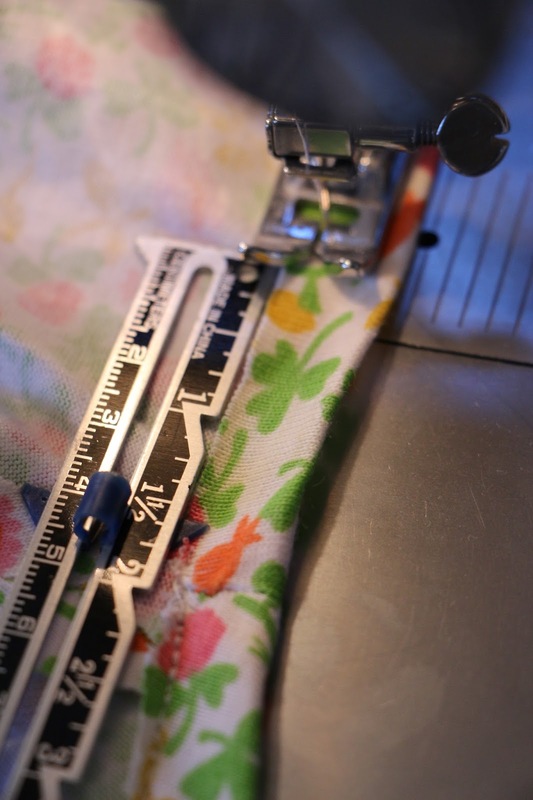 Set the stitch width to "0". Set the stitch length to the normal length, on my machine that's about 3. 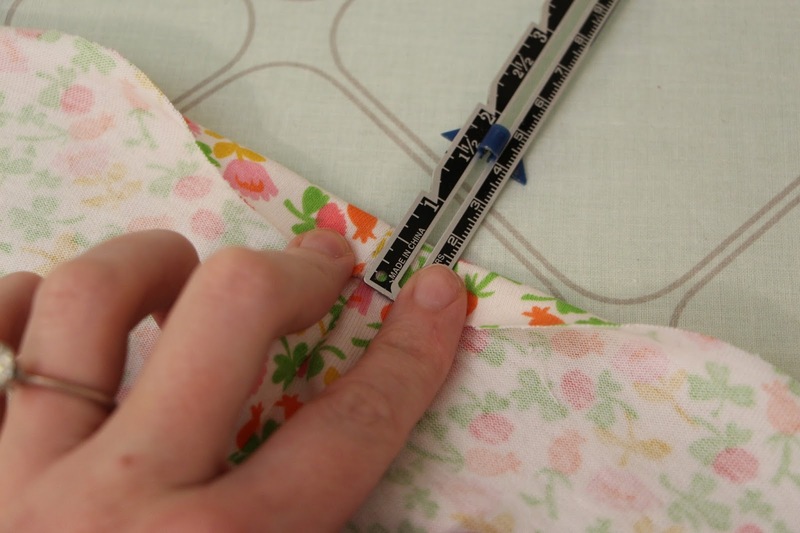 Our seam allowances are 1/2" so find the line on your needle plate to follow for 1/2". Take another deep breath. You've made it this far! That's wonderful. 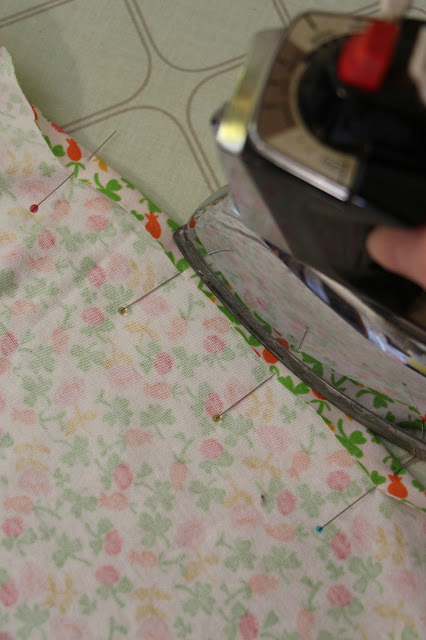 We're going to actually start sewing now. Let's start by sewing one shoulder seam. Keep the edge of the fabric right along the line on your needle plate that measures 1/2" from your needle. Take your time and let your machine take the fabric through at it's own pace. 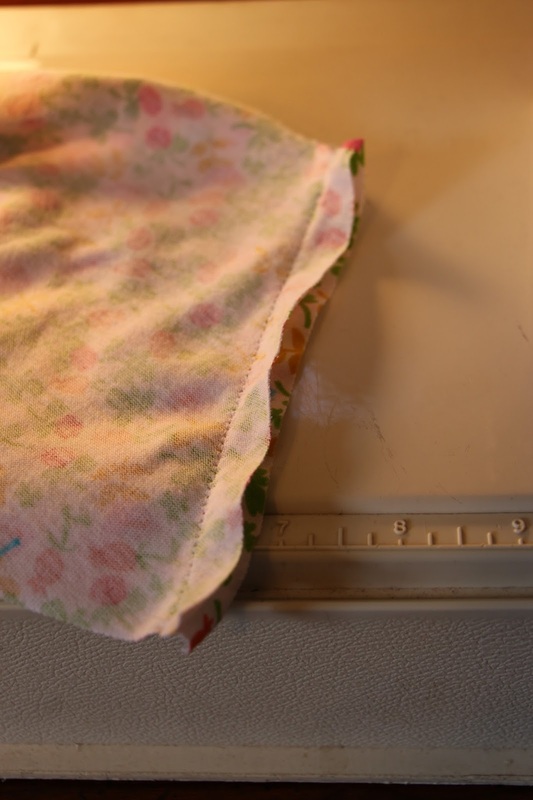 Don't force (or push) the fabric through the machine. You'll know if you're doing this because it will bunch up in front of the presser foot. See the photo below for an example. Don't hold the fabric from moving through the machine. You'll know if you're doing this because it will pull and stretch. See the photo below for an example. 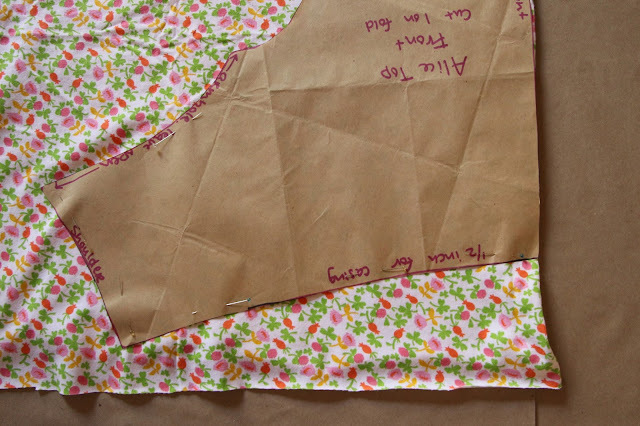 Your finished shoulder seam will look like this. Beautiful work! 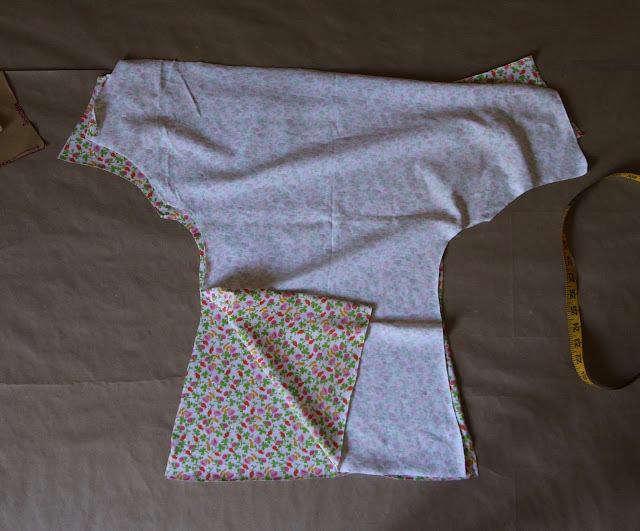 Now let's sew up one side of our top, remember to stop when you reach the armhole (where we marked those X's to remind us not to sew it shut). 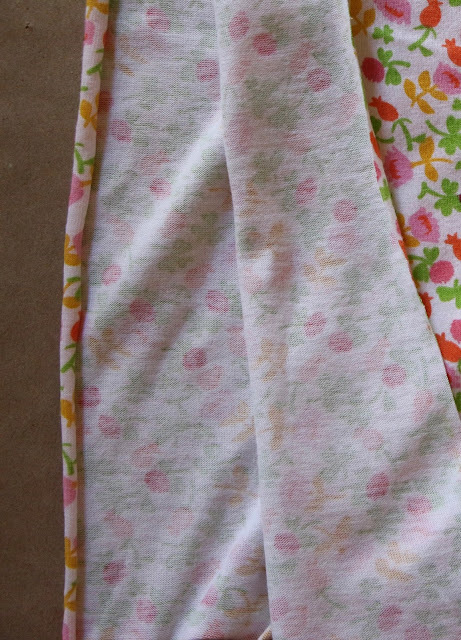 See how nice and smooth my fabric is right before it moves through the machine? That's what yours should look like. 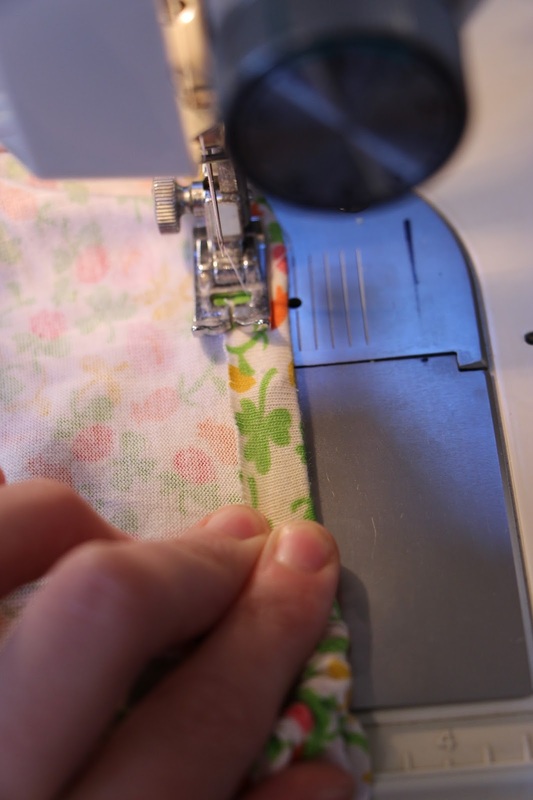 Let your machine do it's job by taking the fabric at it's own pace. Your job is to keep the edge of the fabric along that 1/2" line. 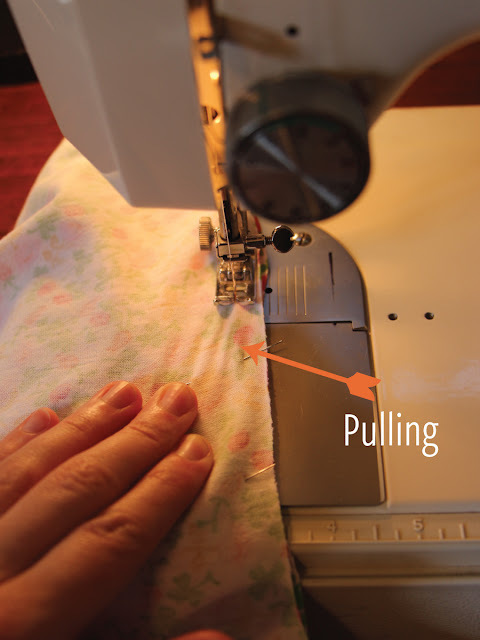 Repeat the above steps by sewing up the other shoulder seam and the other side seam. 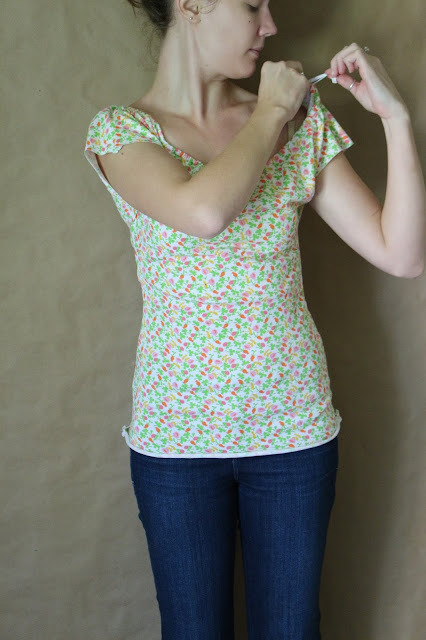 Then hold it up, yell out for joy and pat yourself on the back for having sewn your top together! Along the entire neck edge, fold the fabric over 1/2", pin and press. This creates a casing. 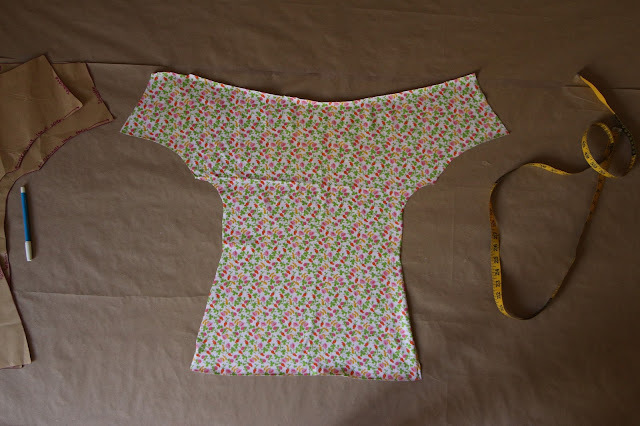 A casing is basically a tube through which our elastic will pass to create the gathered neckline of our top. Here's the neck edge pinned, pressed and ready to be sewn. 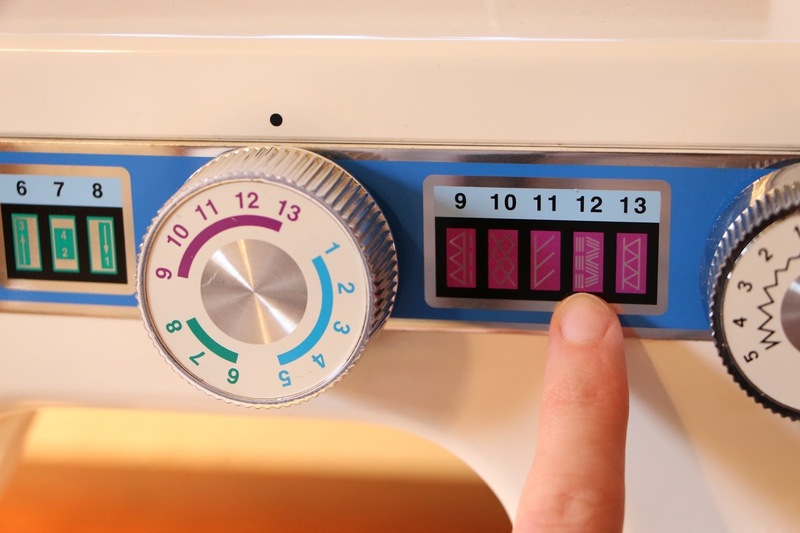 This time, ignore the lines on your needle plate. 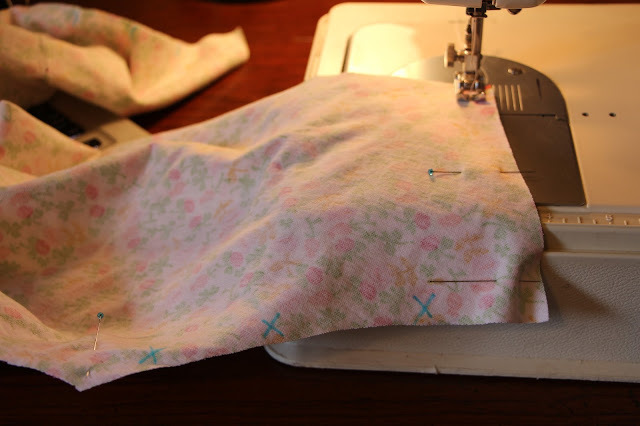 You're going to sew just inside the raw edge (not the folded edge) of the casing. 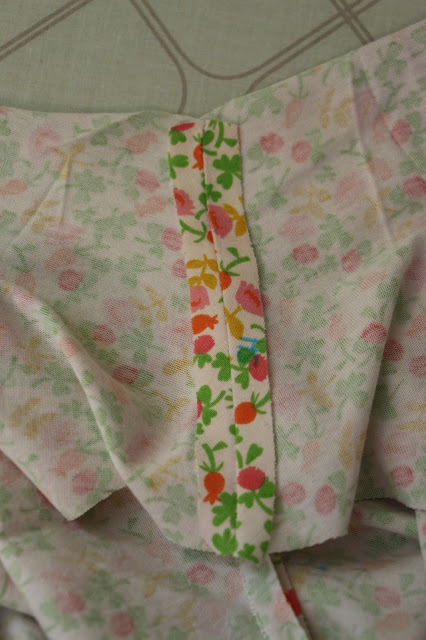 Sew almost all the way around the neck edge. Leave yourself a 1 1/2" opening where you do not sew. 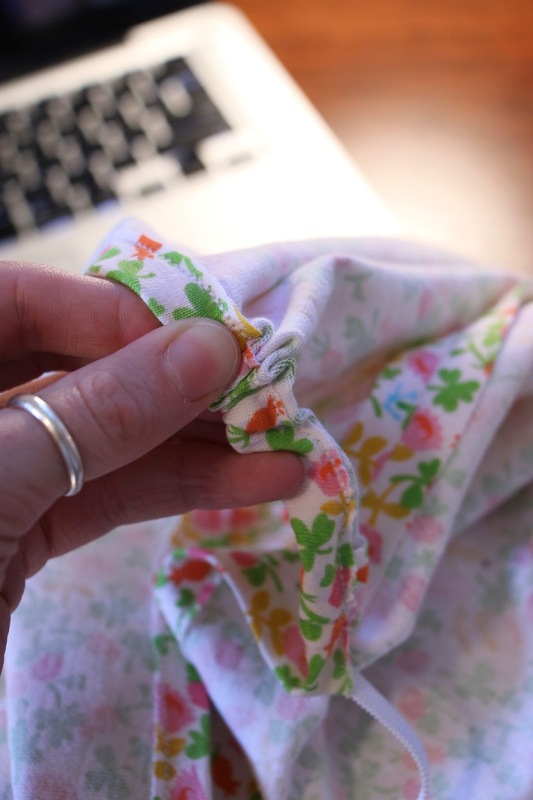 Fold one end of your elastic over about 1" and stick a safety pin through both layers. 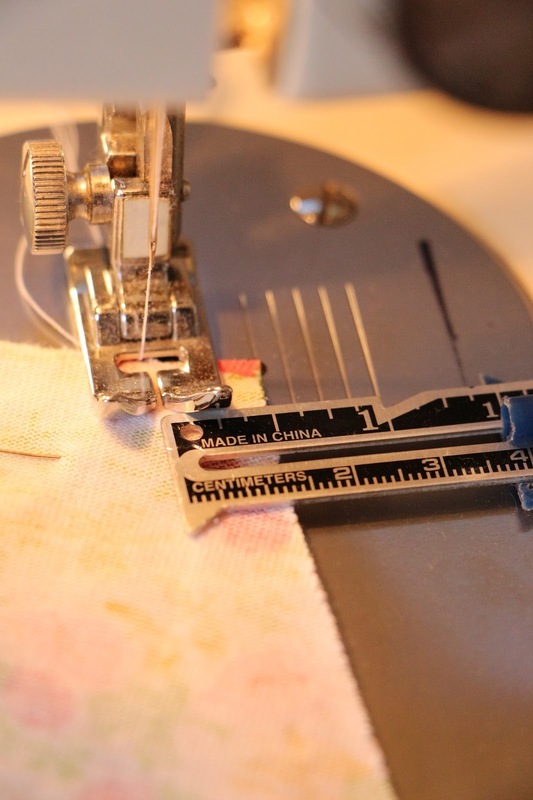 Insert the safety pin into the 1 1/2" opening you made on the casing. 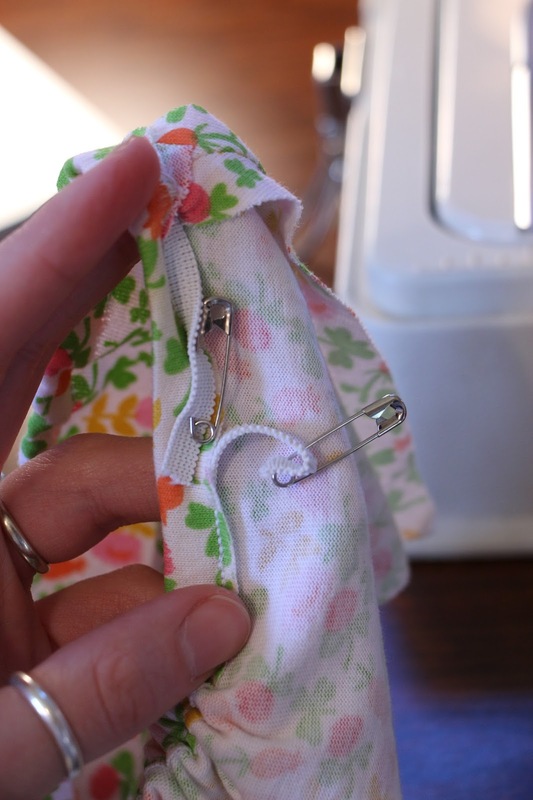 Push the safety pin up as far as you can into the casing. 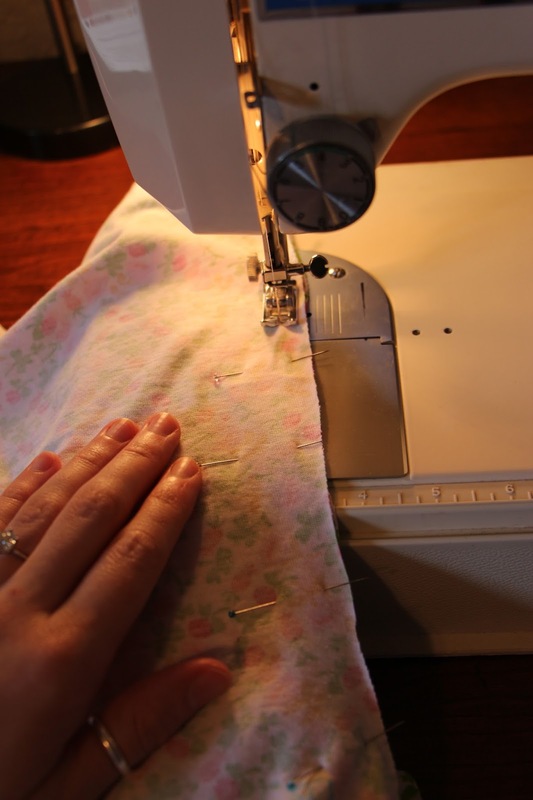 Then, using your thumb and forefinger on your left hand (if you're right handed), hold onto top of the safety pin (through the fabric) and, using your right hand, push the fabric up around the bottom of the safety pin as much as you can. Release the safety pin and push it further up into the casing. I'm holding it with one hand in the photo below because my other hand was busy photographing this. 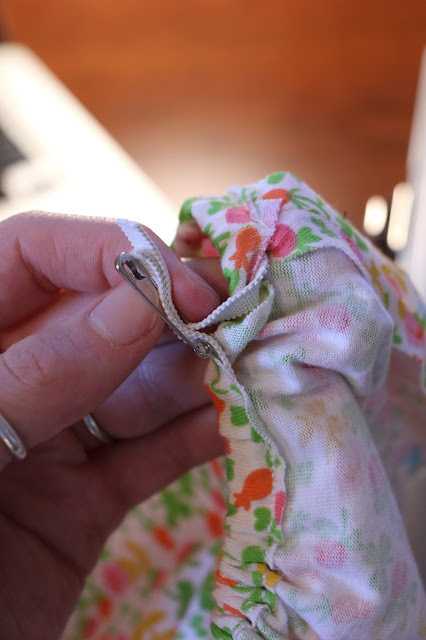 Continue pushing your safety pin and elastic through the casing, pausing when you've moved about 1/2 through the entire casing. 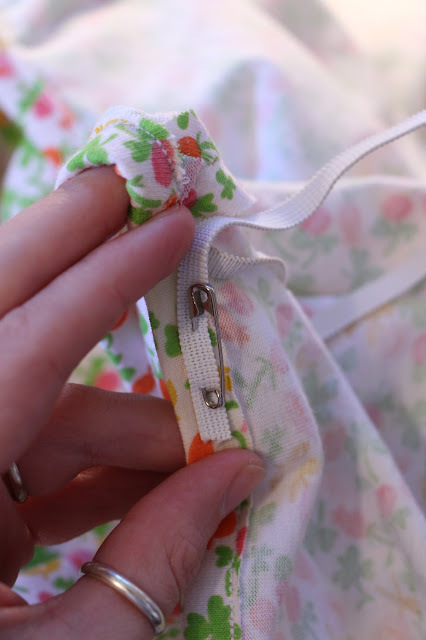 Grab another safety pin and pin the other end of the elastic to your top, near the casing. 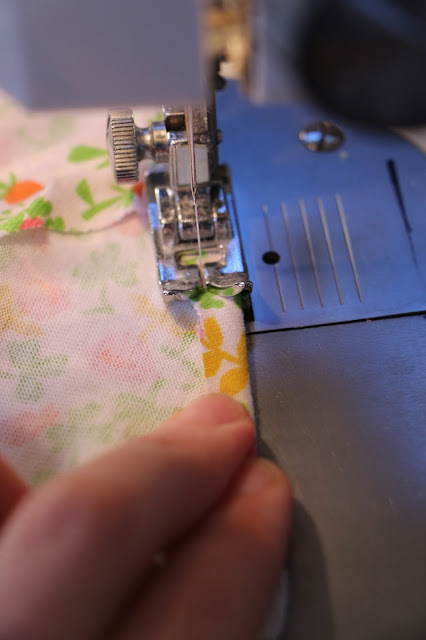 This prevents you from pulling the elastic all the way through the casing and ruining all your fabric pushing and pulling. Continue pushing the safety pin and elastic through until it pops out the opening where you started. 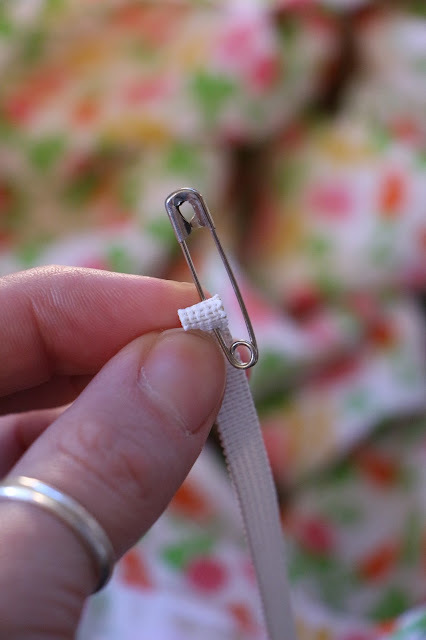 Remove one safety pin, and pin both ends together. Let's try on our top and pull the elastic to fit. 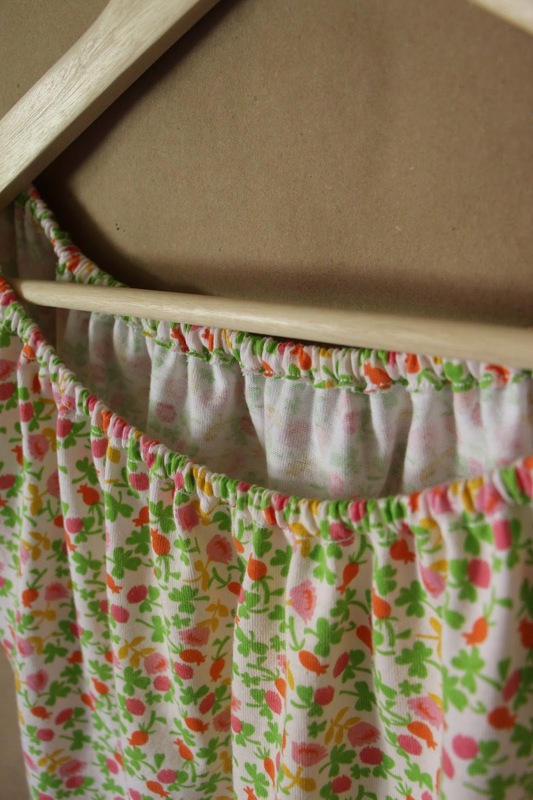 Notice how loose the neck edge of my top is? If I let go, it would flop right off my shoulder. Grab your elastic (both pieces) and pull it out, pushing your fabric along the elastic to smooth it out until the neckline fits comfortably. 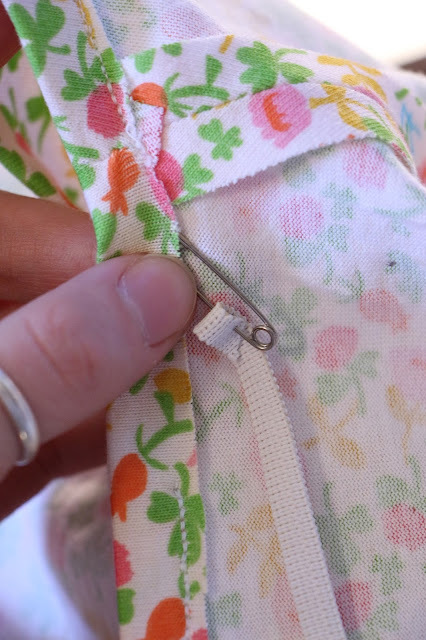 Replace the safety pin where the elastic fits, making sure you pin through both pieces of elastic! be sure to push your fabric along the elastic in back as much as possible too. Now is a good time to ask a friend/husband/roommate for help if you can. And here is how it fits after I've pulled my elastic tighter! 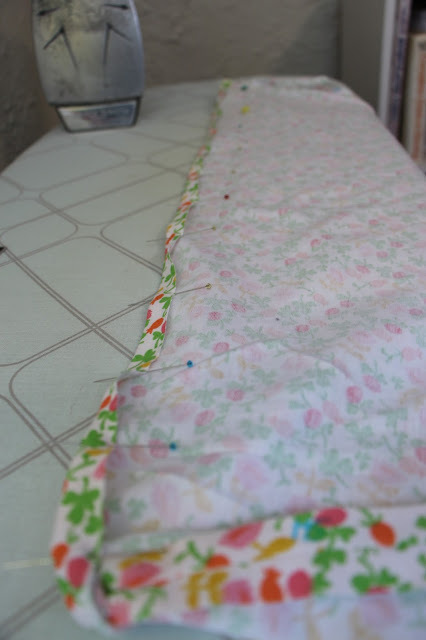 Now, sew through both pieces of elastic where you had pinned it. 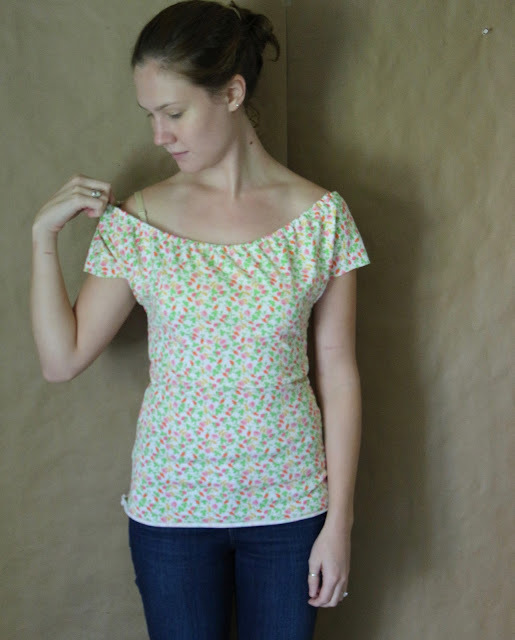 Use that same triple stretch stitch we used to sew our top together. Cut off the excess elastic. Stretching the fabric away from the 1 1/2" opening, sew the opening closed. 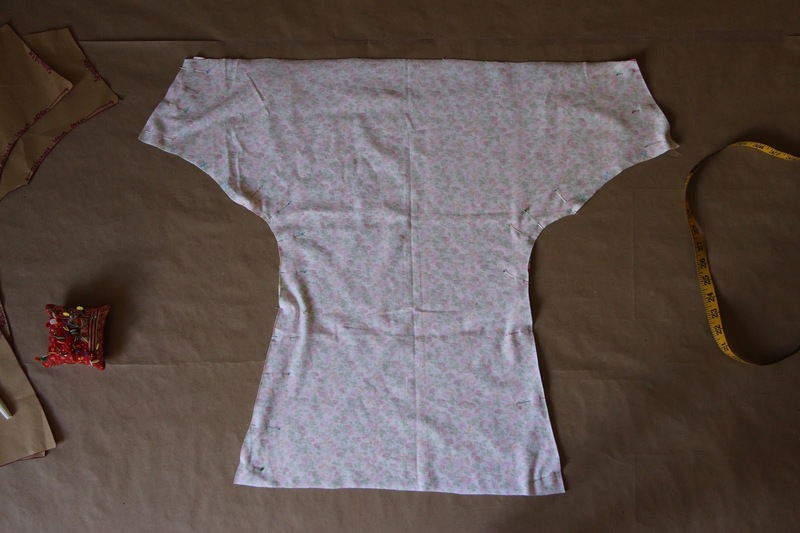 After you've closed up the opening, give your top a good stretch along the neckline to even out the gathers. Home stretch! Let's finish the armholes and hem and then we're done! 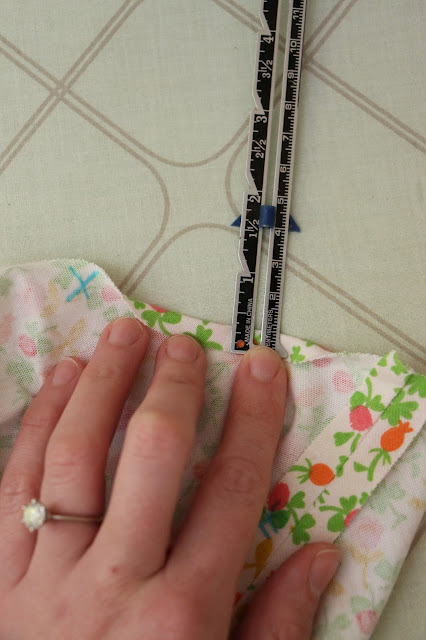 Around the circumference of each armhole (where we marked those Xs to remind us not to sew) measure, pin and press 3/8". 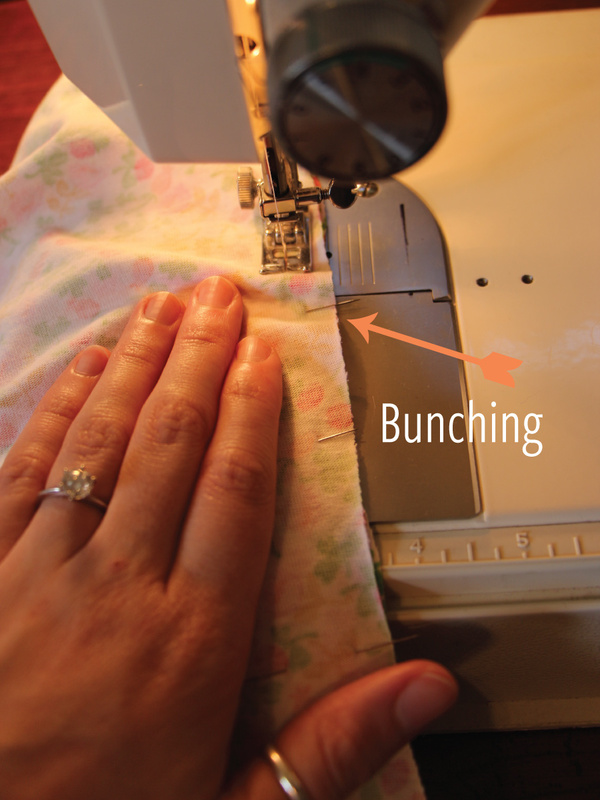 Sew just a hair inside the raw edge (not the folded edge) all the way around each armhole. 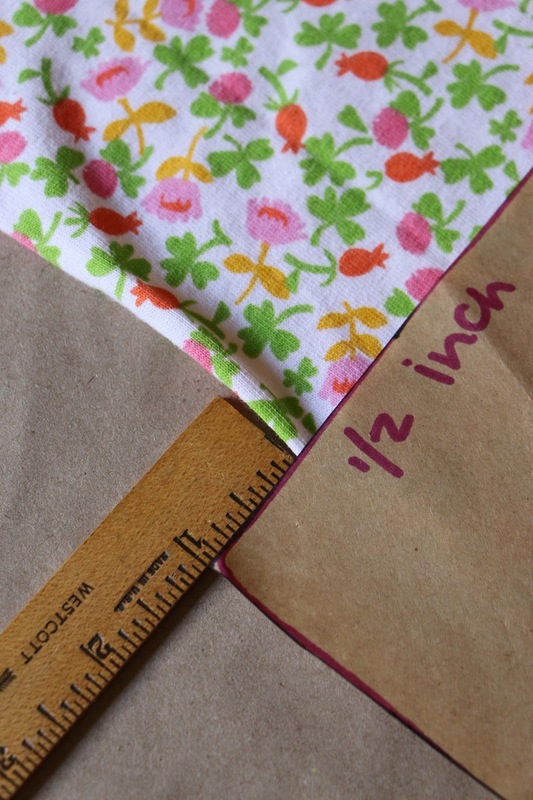 To hem the bottom of our Alice Top, we're going to measure 1/2" all the way around. 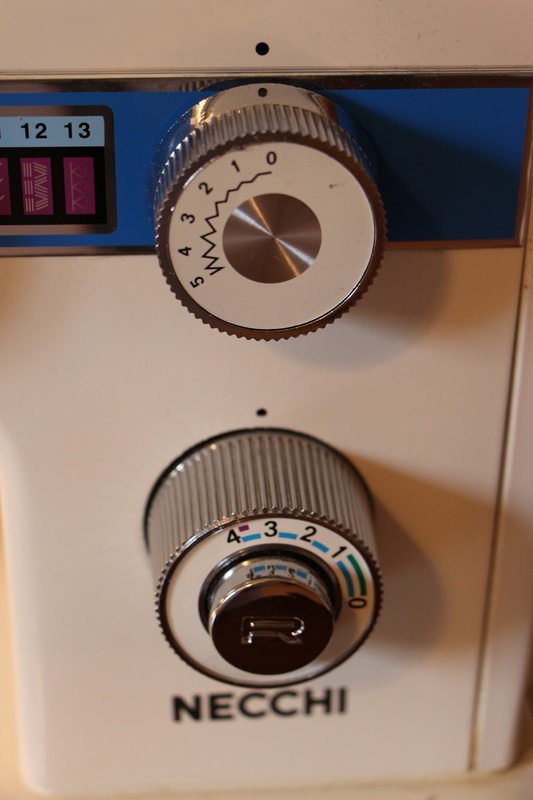 Pin and press. Sew just a hair inside the raw edge (not the folded edge) all the way around the bottom. And you're done! You've completed your Alice Top! Congratulations! Sewing a garment (especially when it's one of your firsts) is SUCH an accomplishment. You should be super proud of yourself, I definitely am. Thanks for sewing along with me today! I stumbled across this post on pinterest and I love the step by step. 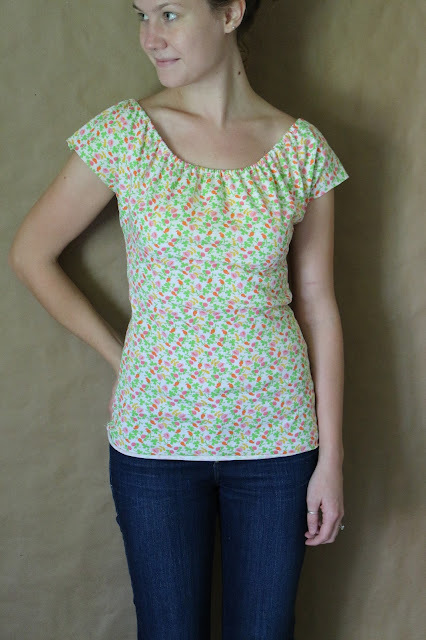 I clicked right over to your Etsy shop and ordered the pattern for this top. I can't wait to try it!!! I'm so happy you found this pattern! Have an awesome time making it and please be sure to send me a picture of your finished product. I can't wait to see what you make. 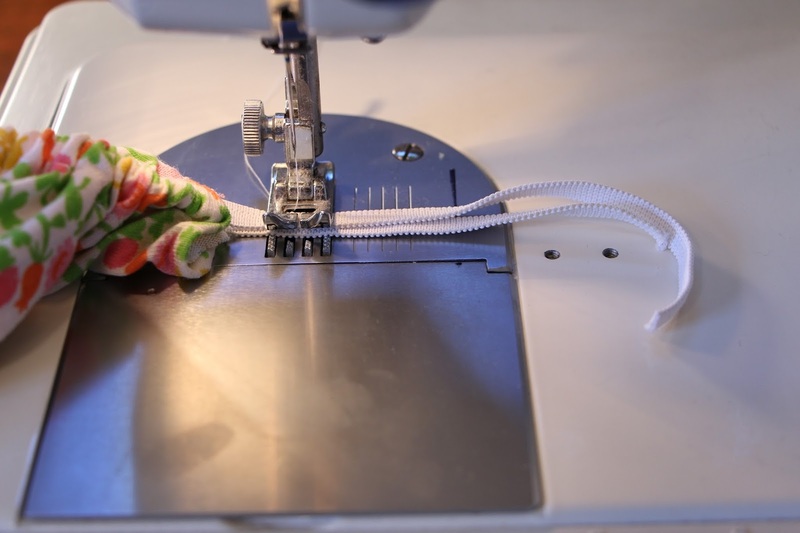 Happy sewing and thank you for your business!